This past week was the annual AOLP Conference & Expo in San Diego, California. 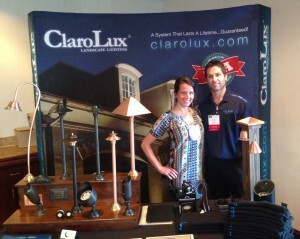 ClaroLux was one of the many exhibitors at the conference. The AOLP Conference took place at the beautiful Catamaran Resort and Spa. It was an absolutely beautiful place and was the perfect setting for the AOLP Expo. We would just like to say thank you to all of the members and speakers for a wonderful trip that was put together. A special thanks to the 2014 AOLP Executive Board Members including Paul Gosselin (President), Paul Welty (Vice President), Gerry De La Vega (Treasurer), Chris Mitchell (Secretary), Matthew Broyles, John Niggli, Michael Deo, Lisa Frye (Executive Director). Speakers Included: Matthew Broyles, Gerry De La Vega, Michael Deo, Kelly Fore Dixon, Paul Gosselin, Chip Israel, Amelia Lima, Laura Morton, Michael Sestak, Scott Sissom, Nathan Smith, Andy Thomas, and Paul Welty. What a pleasure it was to hear you all speak about the ever changing and growing landscape lighting industry. If you have ever dabbled in the landscape lighting industry or watched HGTV’s hit series “Yard Crashers” you are likely familiar with Tommy’s name or his passion for the landscape lighting industry. On many of the Yard Crasher episodes you would see Tommy’s expertise shinning through as he created beautiful nighttime masterpieces for the homeowners. That passion and expertise carry into Tommy’s commitment to provide his clients with exceptional service and quality. 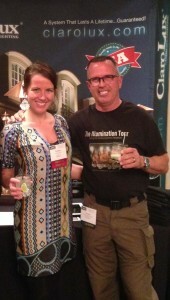 ClaroLux would like to thank Tommy and all of the AOLP members for making the 2014 AOLP Conference a huge success for the ClaroLux Team. Association of Outdoor Lighting Professionals , AOLP, mission is to establish standards, educate industry professionals and increase awareness of the outdoor lighting industry. The Association of Outdoor Lighting Professionals was originally established in 2001 as the Low Voltage Lighting Institute of the Americas (LVLIA). The mission of AOLP is to establish standards, educate industry professionals and increase awareness of the outdoor lighting industry. AOLP is a trade association whose membership consists of contractors, manufacturers, lighting designers, landscape architects and distributors from all over the U.S. and Canada. The main goal of AOLP is to improve the knowledge and abilities of the professionals within the architectural and landscape lighting industry. The Association also provides accreditation programs to become a certified technician or certified landscape lighting designer. AOLP YEARLY CONFERENCES – AOLP KNOWS LIGHTING! Our members include some of the most recognizable names in the industry. They are passionate about lighting and are willing to share their knowledge and experience. Come join us and take your business to the next level. Our members include contractors, design firms, architect firms, electrical companies, distributors and manufacturers. We have professionals who have been in the lighting industry since its inception, and we also have students who are just starting their careers. The one common goal that all of our members have is to better themselves, as well as the industry as a whole. There is no other organization more dedicated to advancing the outdoor lighting industry and its members than AOLP.